Task 1 - Click here to access a short tutorial page about the changing balance of water stored as ice and the sea. Watch the animation carefully, and then complete the worksheet tasks by clicking on the tab to the right. Make notes on the content of both articles including the common misconceptions that exist in this field of research. Task 3 - The North West Passage. Much of the news out there cites the negative impact of sea level rise on the world, however, the video to the right hand side studies the implications of ice melt on improved shipping routes in the Arctic. Watch the video (to the right) and then read the article from the BBC in the first tab below followed by the second article. Whilst doing these tasks, you should take notes on the implications ( + / - ) of this new shipping route on future trade and geopolitical relations. ​Use screenshots from the video as well as graphics from the news articles to illustrate your notes with key data, route and emissions. Use the video to the right to take notes on why sea level rises are recorded to be much higher in certain parts of the world (like New York) than others. It may help to take some screenshots of crucial parts of the video to help revision at a later date. Task 1 - Download the document above and save / print out and place into the sub folder for this unit of work. Complete the following tasks using the information contained within the 12 pages. a. Outline briefly where carbon is present. b. What is the name given for a store of carbon and what is the name given to the movement of carbon between two stores? c. Give an example of three of these movements in the cycle then make a brief copy of figure 1 on page 1 of the document. d. How does the carbon cycle link into the atmospheric energy budget (first lessons in this unit of work)? e. Outline the relationship between carbon sources and carbon sinks. f. What does the abbreviation 'pg' refer to and how it is calculated? e. Create a spider diagram / bullet point list showing the four major carbon pools with a 50 word max explanation of each including pg data. f. Create a further spider diagram / bullet point list that shows the five natural carbon fluxes. g. Make note on how human activity can cause fluxes to occur focusing on fossil fuel combustion and land use change. Task 2 - Using this worksheet and this weblink, complete the activities set out. Task 3 - Using the evidence board below, complete three separate factsheets (in groups if possible) that show the impact of climate change on carbon emitted by ice (glaciers), oceans and the biosphere. Task 1a - Watch the video below (from BBC Newsnight) from September 2017. Explain what the mechanism is that fuels further hurricane development in the Atlantic Ocean and how climate change may contribute to an acceleration in this process. What are the counter arguments to this claim? What Does Climate Science Say? Task 1b - Use the yellow tab below to access your summary sheet to take notes on the information below. ​So what does climate science tell us about the links between climate change and extreme weather and what impact is this likely to have on future events? Is science making progress on the attribution of any one extreme event to climate change? Heat waves: It is no surprise that warming in the atmosphere leads to heat waves, or periods of very hot weather lasting days to weeks. In recent years, the frequency of heat waves has been increasing in many parts of the world, and the risk associated with extreme heat increases with further warming. Storms and flooding: We also know that warming leads to higher sea levels, which in turn increases the risk of storm surge, contributing to the damage brought by hurricanes. Climate change also warms oceans, adding energy that can fuel coastal storms. Compounding this, a warmer atmosphere can hold more moisture, so there can be more moisture for storm systems, resulting in heavier rainfall. The U.S. National Climate Assessment finds that there has been a substantial increase – in intensity, frequency, and duration as well as the number of strongest (Category 4 and 5) storms – in Atlantic Ocean hurricanes since the early 1980s, linked in part to higher sea surface temperatures. By late this century, models on average project a slight decrease in the number of tropical cyclones each year, but an increase in the number of the strongest (Category 4 and 5) hurricanes and greater rainfall rates in hurricanes (increases of about 20 percent averaged near the center of hurricanes). Fires: We know that higher temperatures lead to increased rates of evaporation, leading to rapid drying of soils. This can not only contribute to drought conditions but can stoke forest fires. The U.S. National Climate Assessment finds that in the western forests, large and intense fires are projected to occur more frequently, with large and longer wildfires given higher temperatures and earlier spring snowmelt. ​These trends in extreme weather events are accompanied by longer-term changes as well, including surface and ocean temperature increase over recent decades, snow and ice cover decrease and sea level rise. Task 2 - Watch the series of short videos below (note that LIC / MIC / HIC impact) and outline how climate change may be attributed to an increase in severity and number of droughts around the world. ​Record your notes for the first three videos on the A3 note taking framework below. The fourth video is optional and will give you a wider overview of the situation in the Sahel region of Africa. You should also refer to this current map that shows global distribution of severity of drought events. Using this printed article and this follow up too, highlight the major links to climate change and look for any further synthesis opportunities as well as links to the Sustainable Development Goals. Further Reading Required? - This is a good Guardian Online article to start your search from. 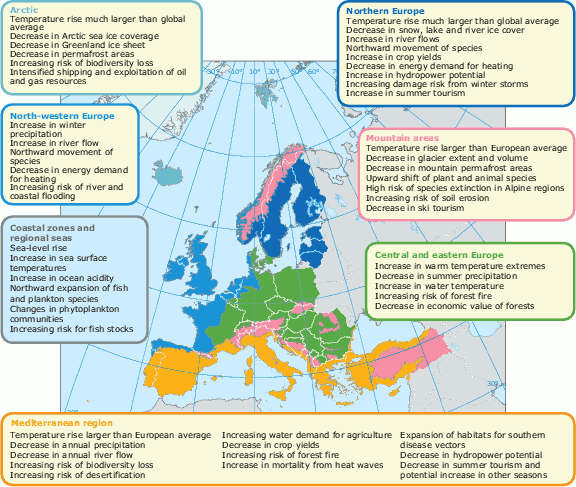 Task 2 - Using the graphic above (Europe centred) (and the Guardian Online article in the last task and this excellent Guardian article too), conduct some further research into specific changing habitats brought about by climate change. For students at IST, you might want to look at this case study (in French) and this news report and video on the same theme. The amazing maps below were compiled by cartographer and analyst Dan Majka who brought this data to life in a series of maps that show what corridors mammals, amphibians, and other animals will use as they move to new habitats under projected climate change. Inspired by wind maps of the United States, and using code from Earth global wind map, adapted by Chris Helm, Majka’s dynamic map allows scientists and the public to see the continent-wide impact of climate change on animals and visualize corridors they will need to move. You can see the full site by clicking here. Task 3 - Describe the movements on either of the two maps above and try to use prior knowledge to explain that movement in particular thinking about where the largest corridors of movement seem to be concentrated, the general direction of movement and linking in to the map showing shifting biomes in the previous lesson. 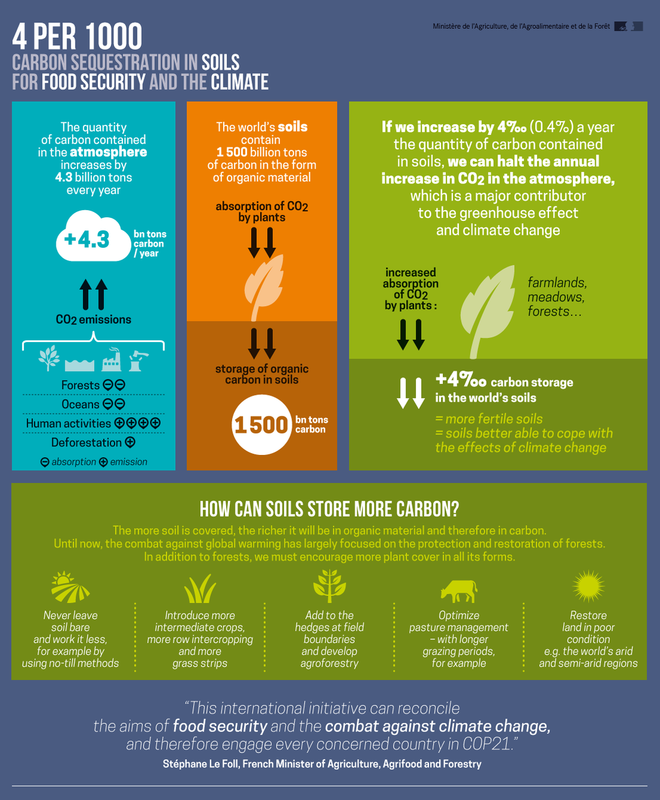 Global Climate Change & ... changes to agriculture, including crop yields, limits of cultivation, soil erosion. Scroll down below to read the OECD report on the issues faced by the agricultural sector linked to Global Climate Change. Task 1 - Complete a piece of synthesis by using the worksheet below in conjunction with the information embedded as well as other resources in this unit, links to the SDGs etc. Starter: Collect some soil in a tub and ask students to rub a small amount into the worksheet to the right. Then write down everything that they know about soil in the space provided. a. Outline then main importance of soil. b. How is soil formed? c. How long does it take to form 10cm of soil? 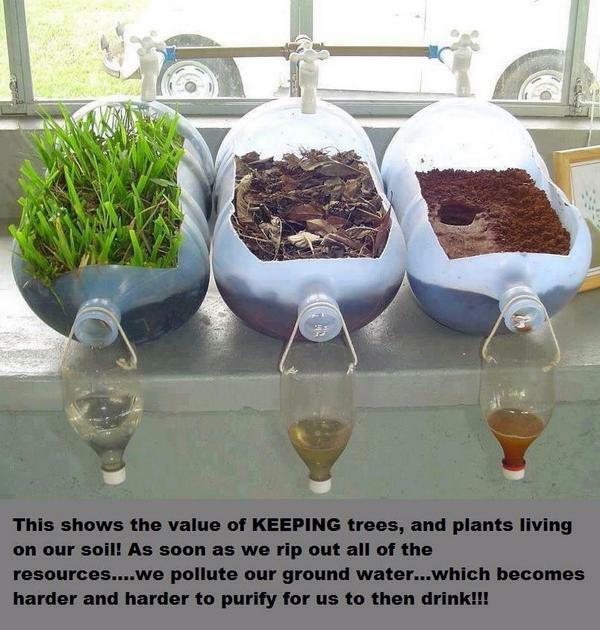 d. How does human activity affect soil erosion? e. How many tonnes were lost in 2011 & what does that equate to in cost per person and annually to the global economy? f. How is fertile land being 'grabbed' from potentially vulnerable populations? g. Why is the issue of soil degradation not "current news"? Describe the distribution of global supplies of stable soil and comment on its suitability for future population use. Watch the first video below to now get a more full view of soil erosion linked to population growth, intensive agricultural activity and carbon storage. Task 3 - Now watch the second video and make notes on how atmospheric carbon can be transferred back into the soil (flux). Now study this website for the '4 pour 1000' French government initiative. Watch the YouTube video embedded on the front page of the site and create a 4 section revision grid and research and extract the four elements of place, possibility, power and process as contained on the site front page. Optional Extension Task - Watch the 28 minute documentary 'The Soil Solution to Climate Change'. Task 1 - Using both of the excellent interactive sites below, work in groups to produce an A2 sized revision poster / Piktochart infographic / Stop Start Animation Video etc... to show the impact of climate change on the vulnerable populations in Bangladesh. Your finished resource should aim to address the issues highlighted in Bangladesh as well as prior knowledge gained from this unit of work together with links to the 4p's & the SDGs.